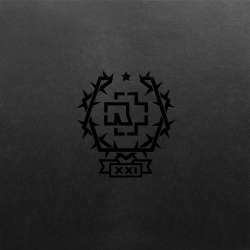 XXI (The Vinyl Box Set) is a compilation released on December 4, 2015, which includes the six albums of Rammstein released so far, plus "Raritäten", a seventh unpublished album of rarities. 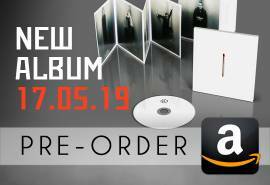 Each album is remastered for the occasion and pressed on two 12-inch and 180-gram vinyls. The Original Single Kollektion (or OSK), released on June 19, 1998, brings together the six singles already out at that time. It comes in the form of a red box taller than wide, with silver writing. With 10,000 copies only, this is one of the most coveted official item. It is not uncommon that its price reaches several hundred dollars, especially since it is increasingly rare. 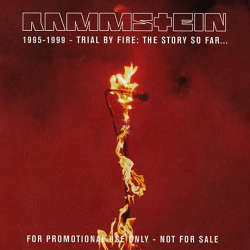 Trial By Fire is a double promotional disc released in the UK in 2000. 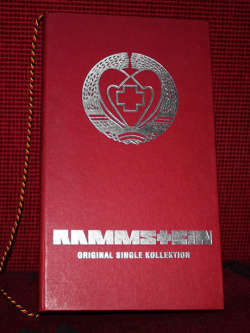 The first disc contains tracks of Herzeleid and Sehnsucht, while the second one contains tracks from the Live aus Berlin. As Trial By Fire has not been marketed, there are just a few copies in circulation. This item is sold sometimes more than 300 dollars. 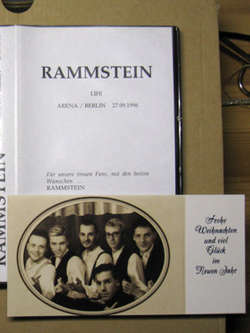 The VHS Der Arena was offered to members of the official fan club of Rammstein for Christmas 1996. It takes its name from the venue that hosted the concert in Berlin on September 27, 1996, immortalized on the VHS. Der Arena is invaluable today, given the lack of copies produced at the time.